Information about a secondary domain stored in the secondary domain database is considered more current and correct than information about that secondary domain stored in the primary domain database. If the primary domain database contains out-of-date information, you can synchronize the primary domain from the secondary domain. When you synchronize the primary domain database from a secondary domain database, any records the secondary domain owns, such as post offices or users added to the secondary domain, are replicated from the secondary domain database to the primary domain database. You must have administrative rights to the primary domain directory and the secondary domain directory from which the primary domain is being synchronized. 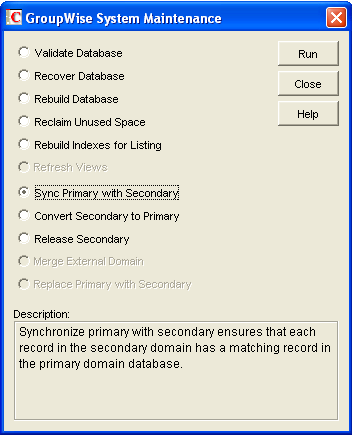 In ConsoleOne, browse to and select the Domain object of the secondary domain whose database you want to use to synchronize the primary domain database. Select Sync Primary with Secondary, then click Run. To make sure the primary domain database is totally up-to-date, repeat the procedure for each secondary domain in your system.